Home / Vape / Electronic or e Shisha or e-Hookah. What is it? By this point, you’ve probably heard quite a lot about E-cigarettes. They’re everywhere at this point, and essentially, if you live in a place where there is some form of this, you’ll be able to find anything that you want, whether it be a vape pen, a huge tank, or even just a full-on mod for you to enjoy. E-cig producers also push this, and many have taken on the hobby of “vaping” just because it looks cool. Some people use this as a cigarette alternative, and many have quit with this. But, there is one area not discussed as of yet, something that should be brought forward here. That is e-shisha. Can you get one of those? How does it work? The idea of holding onto a shisha and carrying about seems so surreal, but luckily, you’ll be able to learn all about them. Read on to find out the mystery behind them, and why many are turning to this as a means to indulge in shisha. What is e-shisha or e hookah? The Difference Between e Shisha and E-Cigs? Any side Effects of e-shisha? If you’ve ever seen an e-cigarette, the e-shisha or e-shisha is essentially a larger and prettier version of this. It’s almost like a sharpie in terms of size, and in all honesty, it is almost like smoking from a cigarette. Basically, take the popular activity of shisha, put it in a sharpie, and there you have it. Essentially, these have similar components to e-cigs, in that they contain the battery, the chamber for the juice itself, and also the atomizer. It’s got a similar structure, in that the battery pushes forward a charge to everything else. If you have a disposable one, it only has a certain battery life, but if you choose to get one that isn’t disposable, or even a mod, usually a USB is provided to charge. Now, like with any e-cig or vaping device, the atomizer is the key here, and it’s what the battery is essentially charging up. Within the atomizer is a heating element, and in essence, when you press the button, you heat this up, and that’s when the liquid becomes vapor, something you’re familiar with if you know of e-cigs. Now, with e-shishas, sometimes they involve a switch that's manual, and it’s put right above the battery. If it’s a button version, you simply press the button, and then you inhale from there. You can get ones without a button as well, and some people like those if they use it a lot more than usual. You may wonder what’s the difference then. The answer, is not that much really. They essentially work the same way, and the best part is that you can use the same liquid, but with different types of mixtures added to it. Both have batteries within it that power up the atomizer, which heats up the liquid within the tank and creates vapor. The difference isn’t in function, but in looks. E-shisha or e-shisha devices in short, look a lot prettier than the e-cigs. They’re much more lavish, and that’s because it actually has a history behind it. The purpose of e-cigs was to give people that strong hint of nicotine really fast, and it was what many smokers used to quit smoking, because they’re less dangerous than the tobacco counterpart. Now e-shisha focuses on flavor, and this actually is used in many cases without nicotine period, which is pretty wild. They’re going for clouds and flavor, and it often doesn't involve getting the kick that’s associated with traditional shisha. But, you can get juice sometimes. Now, the crazy part of this is, that many people are not using the e-cigarette term. Instead, they use the word vaping, regardless of what type of device you use for it. The whole concept of vaping these days has moved from just trying to quit smoking to actually creating big clouds, and crazy and creative flavors. E-shisha in many cases works just like regular shisha, and those users that are looking to move from the shisha pipes that are traditional to the vaping type, it actually almost feels like the same thing in many cases. It does mimic the feeling of smoking shisha with a pipe, but instead of taking in tobacco and other products, you’re essentially getting the sensation and taste of it, plus possible hits of nicotine. Now, both the terms e-cigarette and e-shisha have become interchangeable when you’re speaking of the devices, because the parts of it are virtually the same and they do the same thing. But, there are a couple of differences. Vaping with e-cigs tend to get super complicated. You’ve seen mods probably, and you notice that they can be big, elaborate showcases, whereas shishas are so much more straightforward. That’s why many times the devices are often marketed the way that they are. The shishas are very simple to use, and it doesn't require using a ton of different settings and such to make it work. If you think about it, vaping can have a lot of different modifications, but if you don’t want that, you’re not going to be incorrect in saying e-shisha instead of e-cigarette. This is a big part for many who smoke shisha, because they might wonder how it works, especially if you’re thinking of switching from one to another. If you are a casual shisha user, you’ll find the switch between this so much easier. In essence, it keeps everything from the traditional experience, but if you go with an e-shisha bowl, it’ll enhance the experience even more. Now, if you’re someone who does it a lot though, you’ll start to notice the difference. 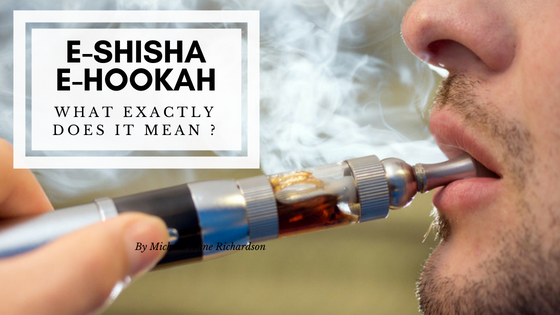 The liquid that’s found in the e-shishas isn’t as good as the real thing. That’s because of the tobacco, or lack thereof and you’ll notice the earthy texture of it is kind of gone. The tobacco make it taste like this, but the thing is, the flavor is pretty close still. But, you will be able to tell the difference. However, is it really a bad thing to switch? There are a few different types of pens you can try out. They have similar uses, but there are different factors that go into this. These are the most commonly seen. They look like e-cigs, and in essence they’re tiny devices you can carry with you and take a hit every so often. They come in many flavor choices, and they also don’t contain nicotine. You simply toss them when you’re done instead of recharging them. This is one that has a rechargeable battery in it, and you can often refill these with whatever liquid you feel like using. It often also has an atomizer that’s replaceable, but in some cases if you want to replace them, you have to get the tank and the atomizer replaced because they’re sold as singular units. It’s important to know however that these act like your average vaping device, so that doesn't mean that the products are that different, and you can try each based on your preference. Often known as the “impostors” by some, but in essence these are different from the pens because they are shaped similar to the hoses you’ve seen before. They’re a bit bigger, and the results aren’t really as covert as the other ones. However, they’re not that big and you can still carry them around. The good thing about this is that they can be filled once again, and charged once again. And, if you want to share with others, you can. They also contain tips that are longer, so more vapor will have to pass to the device before you get the hit. You’ll get a cooler vape when you compare it to other devices, and in some ways, it’s perfect for those looking to replace when they’ve been smoking the real deal for so long. These are essentially the most recent when it comes to the development of different vaping uses. Essentially, they mimic the traditional bowl of shisha that you may have had before, and has the best looks of them all. They do require shisha for these to function, so you may get traditional shisha from this. But, the one thing that isn’t so great about this, is that they’re the least portable, unless you choose a pipe that’s really tiny. But, if you’re someone that is a fanatic about shisha and wants to choose a healthier solution, this is honestly the best one. That’s because since you have to let the vapor travel a long time through water even, you’ll get a super cool hit, and one that feels more like the real thing compared to the other devices mentioned here. It's really the closest you’re going to get without the use of tobacco in the device. The ingredients in this are similar to those in traditional vape juices: water, vegetable glycerine, propylene glycol, and fruit flavoring. All of these are present in vape juices, but it’s a little different with e-shisha. With e-shisha, if you normally smoke traditional shisha, you’ll want to go for flavor. Most people are different, but often, getting a low-nicotine level when it comes to the liquid usually does the trick. That’s because, shisha smoking involves a much smoother feeling, and less throat hit. Less nicotine will mean less of a throat hit, and it’ll feel smoother. When it comes to PG, you get more flavor, but a stronger throat hit, but with VG, you get a smoother feeling, and less throat hit, but also the flavor is a bit less. Ideally, you should go anywhere from 3mg of nicotine within this or less, because you want a very small throat hit, and when it comes to the VG/PG ratio, have it a bit higher on the VG end since it’ll give more flavor. Usually 60/40 or 70/30 will do the trick, and you’ll get a flavor you will love. But, everyone has different taste buds, so you should try out different options, and talk to the retailer you get it from to see what works for you. Currently, there aren't any real side effects minus a possibility of your throat being dry and dehydration due to the propylene glycol in it. But, it doesn’t contain tobacco, so all of those health effects are done away with. Currently though, more studies are being shown. As for how addictive it is, that honestly depends on the product. Lots of the disposable ones don’t contain nicotine, but some have nicotine. Usually, when you’re using nicotine in e-shishas, you can get a very small amount, and it goes a long way when you’re using it. You can get cartridges with various levels of it as well. Now, if you really want nicotine, you can get it, but usually the amounts in this are lower. It may cause addiction, but often, it’s quite rare when you compare it to say, smoking tobacco. It also has way less health risks than traditional tobacco smoking, whether through a cigarette, or through a shisha pipe. This is totally subjective to what the person wants. However, if you want an experience that feels like the real deal, you get an e-shisha bowl. It’s often nice to have heads and bowls because they are the best when it comes to e-shisha variants. Plus, it just tastes a lot better. If you want portable, but also classic shisha feelings, get the e-shisha hose. If you need something portable and don’t care that it doesn’t look like an actual shisha, get one of those rechargeable shisha pens. Finally, if you’re not sure whether you like it or not, go with a disposable shisha pen. This is a good way to figure out if you like it. They are cheap, so if you do try it and find out you don’t like it, you’re not losing a ton of money. E-shisha is becoming more and more popular, and this post discussed why you may want to try it, and some of the good, and not so good, about it.